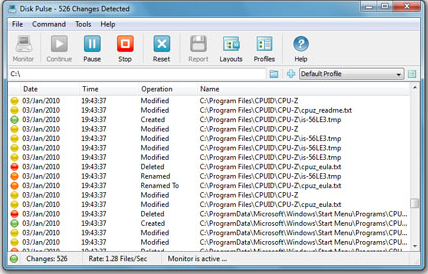 If you are concerned about privacy, and want to know what files and folders have been modified in your Windows OS there’s no easy way to find that information.DiskPulse is a free disk change monitoring utility allowing one to monitor one or more disks or directories and detect file system changes in real-time for Windows and help keep track of modified files and folders. To monitor files and folders, Start DiskPulse and Press “Monitor” and choose the drives and directories you would like to monitor for changes and the app works in the background keeping track of files and kind of operation performed on the specific files and folders. There’s also a PRO Version that can save HTML, Excel CSV and text reports and monitor specific files and also email upon changes to the specific files. DiskPulse is compatible with Windows XP, Windows Vista, Windows 7, Windows Server 2003 and Windows Server 2008.